Layman title: Understanding self-organization: from pattern formation to quantum memories. My research is performed in the Theoretical Quantum Physics group at Saarland University and it focuses on the theory of the interactions between photons and cold atoms. It draws on the progress in cooling atoms with lasers down to temperatures close to absolute zero, which enable us to investigate more deeply new aspects of quantum mechanics. In my model the atoms form a gas cooled to very low temperatures by the electromagnetic radiation. Their interaction with the light induces the formation of crystalline structures, which I characterize. The aim of my work is to provide both a general description of such phenomena as well as to identify their possible impact on new quantum technologies. The focus of the research. An optical resonator is nothing but a photon trap, namely, a pair of mirrors facing each other, against which the light rebounces. Nowadays it is possible to trap photons in optical resonators for relatively long times. Under certain conditions, a gas of atoms within the mirrors may interact via the photons and self-organize in spatially ordered structures. These structures are peculiar, because the spatial order does not emerge from chemical bonds but from photon scattering. In my work I characterize the stationary and the dynamical properties of this peculiar phases of matter. For this purpose I apply advanced mathematical and computational techniques to simulate the time evolution of experimentally measurable quantities. During my stay in Saarbrücken I will develop connections provided by the ColOpt network for improving and making my research more efficient. In this sense I have already started a profitable collaboration with the industrial partner Deutsche Forschungszentrum für Künstliche Intelligenz, which is the German Research Center for Artificial Intelligence. Upcoming collaborations will involve the University of Glasgow (UK), the ETH Zürich (Switzerland) and the Universität Innsbruck (Austria). A deep investigation of self-organization is very interesting, since it occurs at different timescales of several systems involving many components. For example, knowing how stable it is in time and fluctuations can lead to a better understanding of memories’ and galaxies’ formation. Beside, set-ups involving optical resonators, lasers and cold atoms are nowadays considered as key points for developing quantum technologies. Francesco is from Buggiano, a small village in Tuscany, between Florence and Pisa. He studied Physics and earned his Master’s degree from the University of Pisa. He completed a Master’s thesis on fermionic excitations in Bose-Fermi mixtures of Ultracold atoms during an internship at the BEC-Center in Trento under the supervision of Prof. Stefano Giorgini. 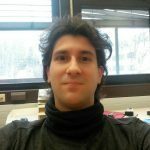 In March 2017 he joined the Theoretical Quantum Optics group at the University of Saarland lead by Prof. Giovanna Morigi as an Early Stage Researcher within the ColOpt project. Apart from Physics, Francesco has always enjoyed playing with Mathematics. In 2010 he participated in the national stage of the Italian Mathematical Olympiad. He also likes sports in general, and his favourite is basketball, which he has played for ten years.